I used to think tile was tile. I didn’t realize how many different types of “rock” could be used, and how it is treated and manufactured makes such a big impact on how it performs. I’ve since researched tile extensively, and this guide contains everything I’ve learned that’s important as a homeowner shopping for tile. The goal is to make sure you get the most out of your investment in your new floor. Before I dive into the details that will make you a tile expert, I’m going to cover a little background on tile: pros and cons as well as how much you should pay. This will let you make sure tile is the perfect floor for your room. I tried to keep this guide as to the point as possible, while also not leaving out any important details. If you read through this guide and still have questions, let me know in the comments below. I get a response to most comments within 24 hours. Your first decision is whether tile is the right tile for your room. Sounds obvious, but I can’t count the time I’ve heard people regret installing the wrong floor. Usually, this could be avoided by a quick review of it’s pros and cons. As you can see, most of tiles advantages makes it great for areas like kitchens, bathrooms, and entryways where staining and moisture are a big problem. It’s disadvantages make it unfriendly to lay on, cold, and not the easiest DIY. It can also be more difficult to repair if you drop heavy objects on it. This makes it not great for living rooms, garages, or in the kitchen if you’re clumsy and drop lots of pans! It also wouldn’t be the easiest DIY (but more on this later). These aren’t definite rules on where to use tile but food for thought. How much should I pay for tile? This is the last section to decide if tile is right for you. And even if you say price doesn’t matter, it’s still important to know what you should pay, so you don’t overpay. Expect to pay about $1 to $3 for inexpensive ceramic tile. For the higher-end of ceramic, porcelain and many other types of tile $3 to $7 per square foot is common. If you’re paying more than $7 per square foot, there needs to be something unique about your tile. That said, many tiles are in this range because tile often is a luxury floor with unique designs. I’ve even seen luxury tile floors as high as $50 per square foot! Installation is around $4 per square foot, but this also varies greatly. Tile requires a lot of perfect cuts due to its rock hard density. More expensive tiles usually are more difficult to cut = higher installation cost. If I lost you with these different types of tile, that’s what I’ll cover next. It may be the most important part of your tile buying decision. Shopping for tile isn’t as simple as finding one that looks the best. Every material and every manufacturing process will make a difference in how your tile performs. The type of tile you choose directly impacts how your floor will perform. More specifically, it will impact the hardness and moisture resistance. You have around 10 different tile options, but the 2 most popular are porcelain and non-porcelain ceramic. Standard ceramic is one of the most affordable tiles but a little more prone to chipping, cracks, and possible water damage (waters still not an issue in most cases). Porcelain is ceramic on steroids. It technically is a ceramic but a harder more moisture resistant version. This is an important decision, and I wouldn’t limit yourself to ceramic and porcelain. If you read one other page on tile, I’d check out our page on different types of tile. It will give you a breakdown of 10 different tile materials. By the end, you’ll be sure you’re picking out the perfect tile for your room. Captain’s warning! Sometimes tiles are labeled as porcelain but fail to meet most industry definition of porcelain, meaning they aren’t as durable. The reason is there is no universal definition of porcelain. You can read more about this, and read about other types of tile flooring here. Next, will move on to other specifications you can look for in a tile floor to help determine it’s durability. Note: some of these are only found with ceramic tile. Most homeowners are going to go with a 2 through 5. Keep in mind, this just takes into account impact durability, not other areas of durability such as water resistance. Therefore, areas like the bathroom where foot are the hardest thing that hit the tile and not very often can do just fine with a PEI of 2 in most cases. If you want to tile other areas of your home, you’ll usually get by with a 3. A 4 may be needed if you think a lot of traffic will come through: kids with cleats, high heels, dropped pans, etc. As for 5, it’s going to be overkill and usually doesn’t look fit for a home. Not all companies will post the PEI rating where it’s easy to find, and others replace it entirely with a “recommended usage” label, which essentially gives the same information. 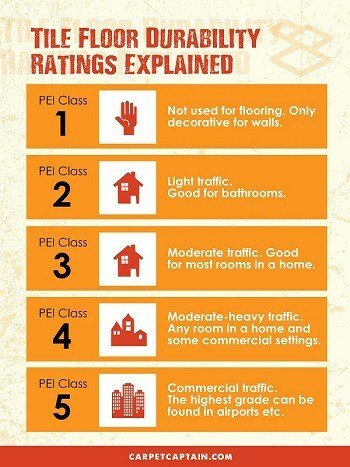 So if you can find it, where is the PEI rating? Check the tear sheet, technical specs, or on the sales sheet. The wettest areas, most commonly bathrooms, can be a problem for tiles that aren’t great at moisture resistance. Non-vitreous: This is the most porous, or the most absorbent, type. Semi-vitreous: less absorptive, but will require more maintenance if exposed to water. Vitreous: the standard for low to medium traffic areas. Very common for indoor and outdoor applications. Impervious: Waterproof, mainly used in industrial and commercial applications. Porcelain tiles are more water resistant than ceramic or natural stone. The clay used to make porcelain tiles has a finer grain, so the finished product will be more waterproof. If you want to place the floor tiles in a bathroom or an outdoor patio, then porcelain will hold up against standing water better in those areas. The pre-existing glaze will act in place of a sealer if you have porcelain tile. Ceramic tiles are more porous than porcelain tiles, but with glaze or sealant they can hold up to water and moisture just as well. Make sure that you follow all of the manufacturer’s suggestions for keeping the tile and grout sealed properly, including how often the tile needs to be resealed. If you are looking at stone tiles, the water resistance will also depend on the sealants that come with the tiles or are applied after the stone is installed in your home. Some stone floors are made out of relatively soft material, such as marble, or highly porous material, such as sandstone, and need the protection to prevent stains and keep out water. Scratches can be a problem for any floor. With tile, you have to worry about pet claws, high heels, dropped objects, and sliding furniture. An old scale used to determine scratch resistance is the Mohs test. It’s a 1 through 10 ranking with the higher the number meaning the more difficult it is to scratch. A floor with a level 2 or lower would likely be scratched with something as simple as a fingernail. You won’t find a level 10 in flooring, unless you’re throwing down some money for a diamond floor. So where does tile flooring land? In general, tile flooring is going to be much higher on the scale than other floors like laminate or luxury vinyl. Softer tiles like ceramic should come in around 4 on the Mohs scale and harder tiles may go up as high as 8 or 9. If you get a 7 or higher, scratches aren’t going to be much of a worry. Even at 5 or 6, it will take heavy furniture moving or a dropped knife to make a scratch happen. Coefficient of friction (COF) is a physics term on how slippery a tile is. If your tile gets wet, you’re going to want to avoid too slippery of a tile. This is especially true for older people or commercial buildings that have liability. COF is on a 0 to 1 scale with higher numbers being less slippery. The Americans with Disabilities Act requires all commercial buildings that use tile to be above a 0.6. For most homes, a number over 0.50 is adequate. Color is one of those things you rarely think of when it comes to the durability of a floor, but it almost always has an indirect impact. The color and gloss may affect the wear rating of the tile floor. Darker tile glazes may be both softer than light-colored glazes, and more likely to show scratches and other signs of wear. High gloss tiles also show more signs of wear, and so their durability is considered less than satin or matte finishes. Once you have an idea of the type of tile you want, you’re ready to go to the store. When you get there, your knowledge of what you want is a huge advantage to prevent from being steered in a wrong direction so a salesman can get a commission. That said, you’re probably going to like the looks of certain tiles that initially weren’t on your radar. And if you need to, you can refer back to this guide and our pros and cons of different tile types to see if it’s something you’d want to consider. It helps to go to a store you trust. You can read our article on different types of flooring stores if you’re not sure where you’re going to shop. It gives you a general idea of the pros and cons of big box stores vs local stores vs online vs in-home salesman. Most store types have a place for the right person and right job. One addition to the article above: If you are DIYing tile floor for the first time, it will help to shop at a local flooring store and maybe even a tile specialty store. These stores will likely give you tips, guides, and help you pre-plan on accessory installation items you’ll need given your setup. This can invaluable for a first time DIY’er. It also helps to know how to negotiate flooring. There are many “win-win” negotiation techniques for flooring that don’t require you to be confrontational, but you get a better deal. A small percentage savings in flooring can be hundreds of dollars. The last thing to consider is when you buy your floor. There are certain times that you may find a better deal and certain times when it can be best to install. Any time of the year will work, so if you’re ready to shop, go shop. But if you’re more flexible, you might give that a read. Tile is definitely a doable DIY, but it’s also not on the easiest. The challenges with tile is its hardness. You have to cut the tile to fit your room and to “bend it” around objects in your kitchen, bathroom, etc. This makes softer tiles like ceramic easier, especially for first-time projects. How to DIY is beyond this article, but this article by Family Handyman does a good job explaining. The opposite of these would make an installation job more difficult and cost more. You can use the above as a reference to make sure you’re getting a fair deal. Rembmer, always assume your installer is being honest, but it’s reasonable to ask why if you don’t think things adds up. You might also check out our guide on how to pick an honest floor installer. A good installer can make all the difference. That didn’t take long, dit it? You’re now up to speed on what it takes to make your tile floor a good investment for your home. Any questions you still have on anything related to tile flooring? Let me know in the comments below.